The RitterSteel® Elite Braided Leather Japanese swords are the “real deal” for all modern warriors… comprising the esthetic beauty of traditional styling with beefy tang construction, and functionality befitting the legacy of the great Samurai heroes of the past! 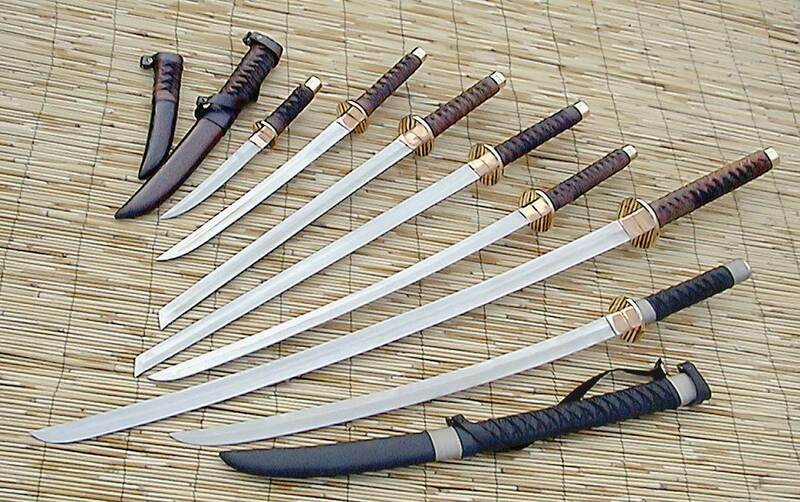 So whether it be the Katana, Ninja, Wakizashi, Tonto, Giant Katana or Odachi sword you are seeking, you will find the perfect blade for your needs in our RitterSteel® Elite Braided Leather Sword Collection! These quality RitterSteel® Elite Japanese sword models have robust tangs with widths reaching up to an inch wide that run up through the grip of the sword! Each model sports a high carbon steel RitterSteel® Elite blade which has been hand pounded and forged over hot coals, using many of the original techniques passed down through generations of ancient sword smiths. Beefy tangs span the length of the tsuka (grip) A traditional solid copper habaki (blade collar) is hand fitted to each blade for performance, while the tsuba (hand guard) and kashira (end cap) are individually hand cast in solid brass or of blackened for functionality and beauty. Each is a work of art and comes complete with its own scabbard hand made from wood, and covered in brown leather as shown. RitterSteel® Elite Braided Leather Collection series of swords pair nicely together and are a must acquisitions for every Japanese sword collection. While others have tried to imitate, none can duplicate the quality of a RitterSteel® Elite sword!